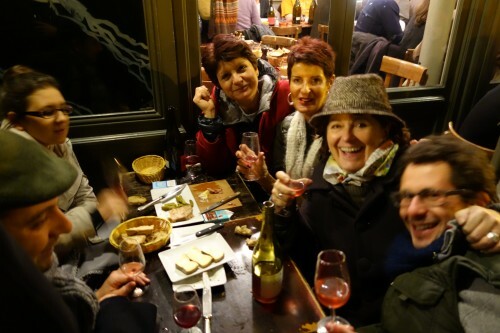 The imminent annual release of Beaujolais Nouveau – no longer a media firestorm in the best of circumstances – may seem, in the wake of last Friday’s Paris terror attacks, about as pertinent as a rubber duck. In such troubled times, who needs wine? Who needs cured ham and cornichons? Who among us needs to gather with friends and loved ones? Who can bring themselves to purchase inexpensive bottles of glimmery young gamay and share it liberally with neighbors? 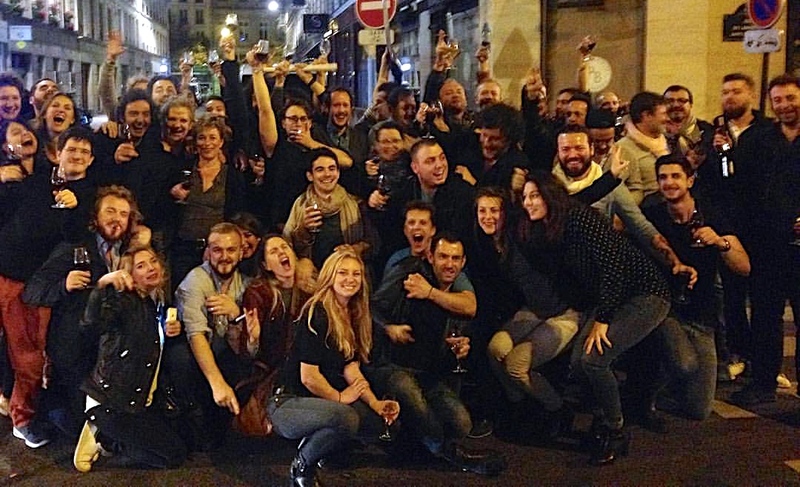 Who wants to support Paris’ liveliest tradition-minded bars and bistrots when their business has been threatened? Well, perhaps quite a few of us. Beaujolais Nouveau, ordinarily an occasion for slightly meaningless fun, can become, in 2015, an occasion for slightly more meaningful fun. Even before terrorists relegated them to marginal news, Beaujolais winemakers had a tough 2015. An unprecedented heatwave and drought in midsummer raised sugar levels and caused grape­skins to thicken. The resulting juice is richer and there is less of it. This is an advantage if one’s tastes happen to run to bigger-than-typical Beaujolais Nouveau: the 2015 wines are naturally darker, rounder, and riper than any time in recent memory, with the more dramatic examples reaching 14.5% alcohol (whereas the minimum permitted alcohol of a Beaujolais Nouveau is a slender 10°). To put it all in perspective: some say the last year Beaujolais was this rich was 1947. That generation had seen its share of dark days, too. What follows is a list and map of the establishments hosting Beaujolais Nouveau parties in 2015, along with whose wines they’ll be serving, and which winemakers, if any, are likely to be present for the occasion. La Robe et le Palais (13 rue des Lavandières Sainte-Opportune, 75001) Owner Olivier Schvirtz and sommelier Loic Mougene throw Paris’ last remaining quality-conscious midnight-release party for Beaujolais Nouveau. Despite the weekend’s events the bar is determined to remain festive, as this year marks the restaurant’s 20th anniversary. Normal dinner service will be followed by an all-night party, with – transport allowing – appearances by most of the winemakers whose wines will be on offer for 14€ / bottle: Xavier Benier, Jean Foillard, Karim Vionnet, Jean-Claude Lapalu, Michel Guignier, Romain Paire, and Stephen Durieu. Mushroom pasta will be served at 3AM. 11:00PM-5:00AM. Café de la Nouvelle Mairie (19 rue des Fossés Saint-Jacques, 75005) Benjamin Courty and Corentin Cucillat are the latest owners of this historic natural wine bar in the 5ème, which has changed hands over the course of its 20 years in business, but has always remained a destination for magnificent wine and simple bistrot cuisine. Saucisse au couteau and a daube de boeuf will accompany the gypsy jazz of Paname Swing and various sought-after primeurs. Beaujo Nouveau by Guy Breton, Jean-Claude Lapalu, Karim Vionnet, plus vin primeur by Nicolas Carmarans. 7:30PM – 1:45AM. Reservations recommended. Ma Cave de Fleury (77 impasse Saint-Denis, 75002) Morgane Fleury, the fairy godmother of natural Champagne, hosts a rollocking Beaujolais Nouveau party with wines from France Gonzalvez, Silvère Trichard, & Remi Dufaitre, along with vin primeur from Jo Landron and Marcel Richaud. 7:00PM – around midnight. La Quincave (17 rue Bréa, 75006) Frédéric Belcamp’s shelf-sized Montparnasse wine bar inaugurates three nights of “Bubbles & Beaujolais.” Come early for a range of pétillant naturels and Beaujolais Nouveau from Guy Breton, Karim Vionnet, Jean Foillard, Karim Vionnet, Rémi Dufaitre, Stephen Durieu, and France Goncalves – but stay for the crowd, which reliably consists of a who’s-who of the natural Beaujolais vanguard. From 7:00PM. Le Repaire de Cartouche (8 boulevard des Filles du Calvaire, 75011) Legendary terrine maestro Rodolphe Paquin celebrates Beaujo Nouveau with gusto. (Last year’s soirée saw him gamely swap t-shirts with a buxom reveler behind the bar.) Beaujolais Nouveau from Karim Vionnet & Xavier Benier, along with vin primeur from Thierry Puzelat and “a surprise wine.” Music: A live accordian-guitar-chanteuse combo. Bottles will be priced at 30€ – but they come with free small plates all evening. For those wishing to get started celebrating at lunchtime, Paquin will propose a special Beaujolais Nouveau menu consisting of oysters, coq qu vin, and a tarte aux pommes. Lunch: 12:00PM – 2:30PM. Party: 7:30PM – 1:45AM. Le Rubis (14, rue Léopold Bellan, 75002) Marie Carmarans and Geraldine Sarfati, co-owners of natural wine bistrot Le Rubis, will be serving Beaujolais Nouveau by Remi Dufaitre, Guy Breton, and Karim Vionnet, as well as a primeur from Marie’s ex-husband, Nicolas Carmarans. 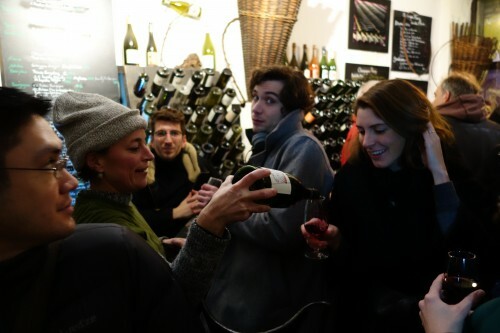 The Carmarans’ formerly ran left-bank natural wine institution La Café de la Nouvelle Mairie, and Marie maintains the faithful support of many pioneering natural winemakers, so expect a lot of winemaker drop-ins. Music by Le Rubis Swing Quartet. 6:00PM – 1:45AM. Au Sauvignon (80 rue des Saints-Pères, 75007) This well-preserved, 3rd-generation Auvergnat café boasts an accordion and keyboard duo and a special hot meal for the occasion: Auvergnat sausage and potatoes, available by reservation only. 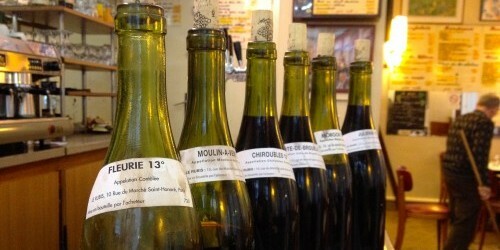 Morgon winemaker Karim Vionnet will be present early on, serving his Beaujolais nouveau and that of Jean-Claude Lapalu. From 7:00PM. La Cave des Papilles (35 rue Daguerre, 75014) Gerard Katz’s venerable natural wine shop offers a tasting of vin primeurs that run the gamut of the viticultural regions of France. Beaujolais Nouveaux from Jean-Claude Lapalu, Karim Vionnet, and Sylvère Trichard, plus other vins primeurs from Jo Landron (Loire), Marc Houtin and Julien Bresteau (Loire), Jean-Christophe Comor (Provence), Marchel Richaud (Rhône), & Jean-François Nicq (Rousillon). 6:00PM – 9:30PM. 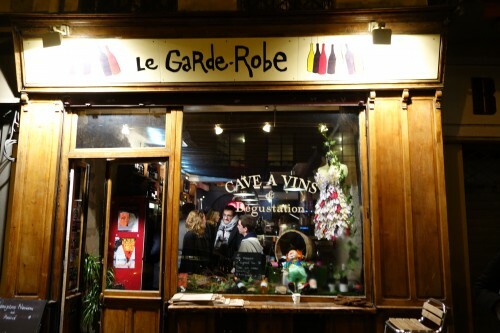 Le Garde Robe (41 rue de l’Arbre Sec, 75001) Winemaker Sylvère Trichard will be present, along with copious bowls of onion soup at this popular natural wine bar by the Louvre. They’ll also be pouring Beaujolais Nouveau by France Rémi Dufaitre and Stephan Durieux and serving a round of ratafia (think French amaro, only sweeter) at midnight. Music, according to management, will depend on how rammed it gets inside the bar. 7:00PM – 2:00AM. Coinstot Vino (26 passage des Panoramas, 75002) Guillaume Dupré’s evocative terraced bar in the Passage des Panoramas will roll out magnums from seven winemakers, including Olivier Fallecker, France Gonzalvez, Sylvère Trichard, Raphaël et Christelle Champier, Stephen Durieu, Karim Vionnet, and Sarnin-Berrux from the region. From 6pm onward. Juveniles (47 rue de Richelieu, 75001) Tim Johnston’s homey wine bistrot – now run by his daughter and son-in-law – will offer a Beaujolais-themed menu service for the evening. Reservations are a must. But the restaurant invites all and sundry for apéros until 8PM, featuring Johnston’s own cuvée of Beaujolais Nouveau by Pierre-Marie Chermette. 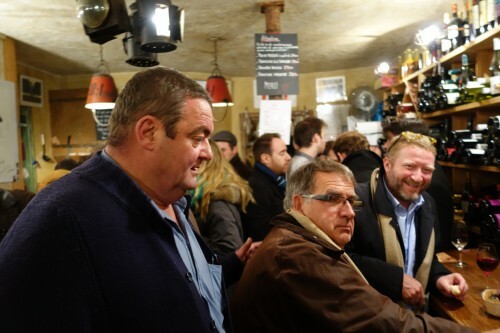 Le Rubis (10 rue du Marché Saint-Honoré, 75001) Comically gruff proprietor Albert Prat is among the last Parisian restaurateurs to purchase all his Beaujolais by the barrel. He hasn’t yet confirmed who will source his nouveau for this year. But if you get sick of the fresh, fruity stuff, his unlabeled bottles of Côte de Brouilly still contain wine from appellation standard-bearers Chateau Thivin. The toilet may be Turkish and the service may be on the sunny side of ferocious, but Beaujolais Nouveau at Le Rubis’ zinc bar remains a fascinating glimpse into a world before Beaujolais became a bad word. Bistrot Papillon (6 rue Papillon, 75009) Restaurateurs Vincent Gordien and Laurent Bigot’s fledgling market menu restaurant will host a book signing by Léon Mazella, author of “Le Dictionnaire Chic du Vin,” accompanied by glasses of Karim Vionnet’s Beaujolais Nouveau and an acoustic duo. 6:00PM – 8:30PM. L’Entrée des Artistes (30 rue Victor Masse, 75009) For their Beaujolais Nouveau parties at their previous location in the 11ème arrondissement, owners Edouard Vermynk and Fabien Lombardi reliably drew a bevy of major natural Beaujolais producers to their counter for gin & tonics after-hours. This year they’ll transfer the tradition to their new, plusher digs in Pigalle. The selection of primeurs is still TBD, but the music is confirmed: a vinyl-only jazz and French disco DJ set. 7:00PM – 2:00AM. 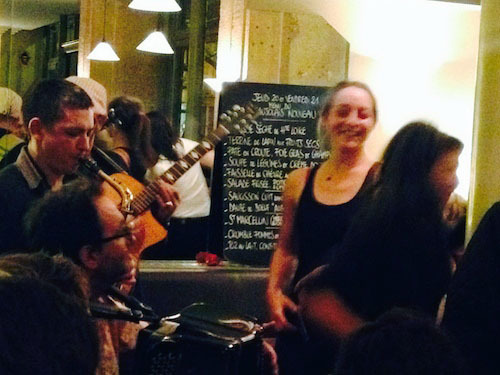 La Pointe du Grouin (8 rue de Belzunce, 75010) Thierry Breton’s expansive, anarchic, service-free wine bar will host a concert, a buffet of his frank country cuisine, and full barrel of Château Cambon Beaujolais Nouveau. From 8:00PM. 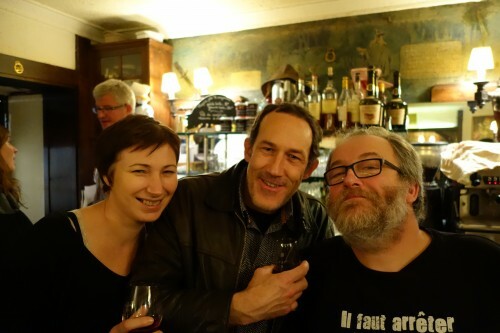 La Buvette (67 rue Saint Maur, 75011) Winemakers Marcel Joubert and Sylvère Trichard will pass through at Camille Fourmont’s bright, thimble-sized rue Saint Maur wine bar. Beaujolais Nouveau from Joubert, Trichard, Jean-Claude Lapalu and Rémi Dufaitre. 6:00PM – 1:00AM. Le Lapin Blanc (84, rue de Ménilmontant, 75020) Cavernous wine rabbit-hole Le Lapin Blanc will offer Beaujolais Nouveau by Stephen Durieux, Raphael Champier, and Karim Vionnet, along with a Muscadet primeur by Jérémie Mourat. Plenty of snacks will be available, ranging from hummous to burrata and oeufs mayonnaise. The music will be a specially curated playlist by former Nova journalist Seb the Player. This year’s event also marks the start of a three-day party to celebrate the bar’s three years in business. 7:00PM – 12:00AM. Au Nouveau Nez (104 rue Saint-Maur) will be serving bottles from Cyril-Florian, Sylvère Trichard, Xavier Benier and the sauvignon from PO Bonhomme from noon to midnight. Dune (20 rue Keller, 75011) will be serving bottles of Beaujolais Nouveau from biodynamic producer Thierry Harel, with small plates and finger food by American chef (ex-Bones) Evan Leichtling. From 7pm onward. Les Caves de Reuilly (11, boulevard de Reuilly, 75012) Owner Pierre Riouallon will be pouring Beaujolais Nouveau by Karim Vionnet, Jean-Claude Lapalu, Remi Dufaitre, and France Gonzalves. The cave-à-manger’s distant location should be more than made up for by its vast, never-ending terrace. 5€ entry. 5:00PM – 12:00AM. 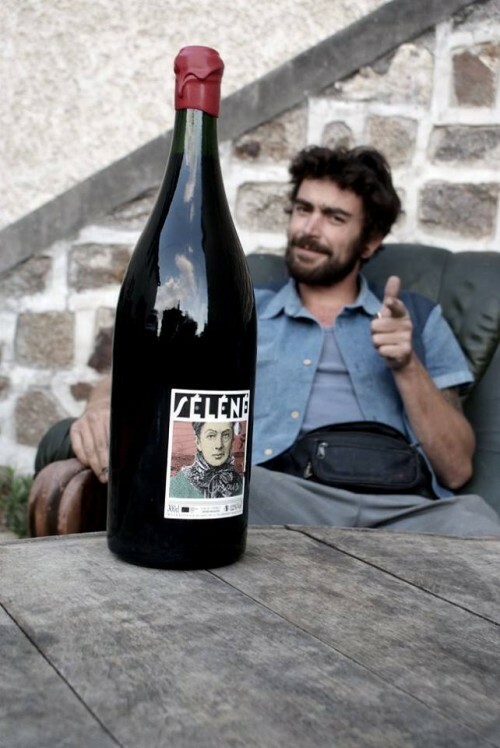 Le Siffleur de Ballons (34 rue de Citeaux, 75012) Sommelier-restaurateur Thierry Brumeau’s neighborhood natural wine bar will propose a special t-shirt design, plus Beaujolais Nouveau from Xavier Benier. The bar is also using the occassion its fifth birthday, so the atmosphere should be really festive. 6:30PM – 1:45AM. Les Pères Populaires (46, rue de Buzenval, 75020) The Pères Populaires group’s eponymous eastside wine bar is proposing a barrel of Georges Descombes’ Beaujolais Nouveau, a pick-up-and-play policy with the bar’s guitar, and saucisse seche. From 7:00PM. 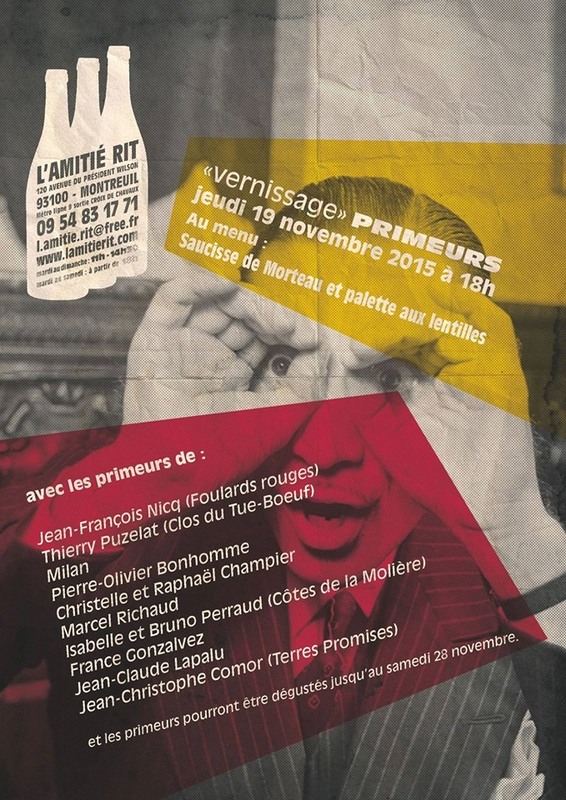 L’Amitié Rit (120 Avenue du Président Wilson in Montreuil) Thierry Dubourg’s natural wine bar in Montreuil will be serving saucisse de Morteau and lentils along with primeurs from Thierry Puzelat, Jean-Claude Lapalu, Isabelle et Bruno Perraud, France Gonzalvez, Henri Milan, Jean-François Nicqn and others. From 6pm onwards. I live in NYC and drank Kermit Lynch BN last night…it was terrific. I hope to visit Paris again as soon as I can.